The Advocate is BC FORUM’s official newsletter, produced three/four times a year and available on this website for download. Download the Spring 2019 issue or read selected articles here. Download and read the Winter 2018 issue or read selected articles here. Download and read the Autumn 2018 issue or read selected articles here. Download and read The Advocate Summer 2018 issue or read selected articles here. Download and read The Advocate Spring 2018 issue or read selected articles here. Download and read The Advocate Winter 2017 issue or read selected articles here. Download and read The Advocate Autumn 2017 issue or read selected articles here. Download The Advocate Summer 2017 issue or read selected articles here. Download The Advocate Spring 2017 issue or read selected articles here. Download The Advocate Winter 2016 issue or read selected articles here. Download The Advocate Autumn 2016 issue or read selected articles here. Download The Advocate Spring 2016 issue or read selected articles here. Download The Advocate Winter 2015 issue or read selected article here. Download The Advocate Autumn 2015 - Special Federal Election issue or read selected articles here. Download The Advocate Summer 2015 issue or read selected articles here. Download The Advocate Spring 2015 issue or read selected articles here. Download The Advocate December 2014 issue or read selected articles here. Download The Advocate October 2014 issue or read selected articles here. Download The Advocate June 2014 issue or read selected articles here. Download The Advocate April 2014 issue or read selected articles here. Download The Advocate January 2014 issue or read selected articles here. 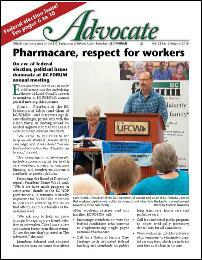 Read The Advocate September 2013 issue here. Read The Advocate Spring 2013 Special Election issue here. Read The Advocate March 2013 issue here. Read The Advocate December 2013 issue here. Read The Advocate September 2012 issue here. Read The Advocate May 2012 issue here. Read The Advocate March 2012 issue here. Copyright © 2009-2017 BC Federation of Retired Union Members. All rights reserved.